NOTE: This book is now available for purchase. I was given a free Advance Reading Copy by Pegasus Books in exchange for an honest review. If you would like to send me an ARC, please see this page. PLOT SUMMARY: Coralline is a sweet, shy mermaid whose world is upended in three major ways. First, she's sacked from her job at a local clinic. Second, the merman of her dreams proposes to her. And third, a dangerous oil spill sends her little brother to the brink of death. Meanwhile, a human man, Izar, has created an invention that will bring him untold riches... as well as drive merpeople to extinction. When Coralline leaves home to try and find a way to save her brother, she crosses paths with Izar, recently turned into a merman for reasons neither of them can figure out. The two form an unlikely alliance to try and find a solution for both of their problems, before the oil spill can claim Coralline's brother's life, and before Izar's enemies can catch up to him. THOUGHTS ON PLOT: This begins as a gender-flipped version of The Little Mermaid, but I was very pleasantly surprised when it veers off in a different direction and does its own thing. Retellings are great, but it's always nice when they take on a life of their own. I have mixed feelings towards the first third, which is mostly dedicated to setting up the circumstances under which Izar and Coralline meet. I really enjoyed Izar's sections, showcasing his work at Ocean Dominion, but the sections focusing on Coralline felt a bit draggy. The pace improved significantly when Izar and Coralline finally cross paths, and I always enjoy a good "get the thing" plot. My main gripe is that I wasn't fully invested in the romance (more on that in the section below), and since it was so integral to the plot, that kept me from being 100% into it. But that being said, I did really enjoy the overall plot of this book, especially concerning Izar's backstory. THOUGHTS ON CHARACTERS: Something of a mixed bag. Gleaning off other reviews of this book, I know the heroine Coralline is... divisive. But I liked her -- and I did find a lot of the criticisms of her to be kind of unfair. (The girl's brother is dying, she's got the right to panic.) One criticism I did agree with, however, is that she seems to act much younger than she's supposed to be -- I initially thought this book was YA and Coralline was supposed to be like... seventeen, eighteen years old. But she's supposed to be in her mid-twenties, which does make her seem a touch immature. In spite of my initial misgivings (since he's, ya know, introduced trying to drive a sentient species to extinction), I did wind up liking Izar, and I enjoyed watching him develop into a better person. However, I did find that development to be a bit rushed; I would've liked to see more time spent on his redemption arc. Consequentially, I also found it hard to believe that Coralline fell for him so quickly, especially since she has a perfectly nice fiance at home. Most of the side characters were pretty one-note (especially the antagonist of Izar's subplot, which was a real disappointment), but we did get one major exception: Coralline's boss at the clinic, Rhodoelma. I would totally read a book about her, she was great. THOUGHTS ON WRITING STYLE: I thought that the author's descriptions of the ocean world where Coralline lives were just beautiful. You could really visualize this magical, undersea society, and I just loved reading about it. As mentioned above, I did have some problems with the initial pacing, but I was glad to see that that sorted itself out once Izar and Coralline actually did meet. 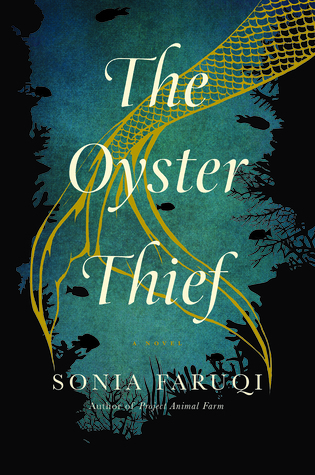 Overall, I think Sonia Faruqi has a real talent with prose and descriptive writing, and she did a great job of creating her world. THOUGHTS ON POLITICAL STUFF: So my main complaint about this book is that nearly all the female characters besides Coralline (and her too, to an extent) seem to exist primarily based on their relationships to male characters. Even Rhodoelma, who I really loved, fell victim to this, which is a real shame since she was otherwise a really cool mentor character. In fact, aside from Rodoelma, and her mother's muse, Coralline doesn't seem to have any positive female relationships at all. In particular, Izar's human girlfriend seemed to exist only to be his human girlfriend, and cause some convenient plot tension. It just feels like a whole bunch of opportunity was wasted here, especially with regards to Coralline's relationships with her mother and Rhodoelma. FINAL THOUGHTS: If you're looking for a fresh, fun take on The Little Mermaid, I'd definitely suggest checking out The Oyster Thief. It's a bit tropey, yes, but tropes aren't necessarily bad, and it was an extremely entertaining ride. I thought it created a fun world with a lot to offer, and it's a great read for anyone who's looking for some good fantasy fiction for adults. (Though there's no reason fans of YA wouldn't enjoy this one.) While I did have my issues with it, I enjoyed myself while reading, and I think others will, too. Who knows? Maybe mermaids will become the new hot Thing™ in the fantasy market. One can dream. An extra-special thanks to Tasneem for sending me an ARC of this book! I really enjoyed it, and I'm glad I got a chance to read it before it officially hit the shelves. 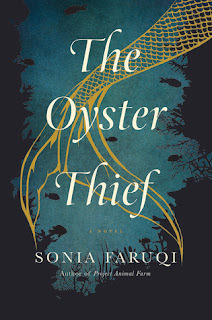 If you've read The Oyster Thief, I'd love to hear your thoughts in the comments below!